There’s a reason why any director should think twice before creating a follow-up for a classic; the comparison is inevitable and it’s hard to fill those shoes. Halloween attempts to fill the shoes of a 1978 horror classic and the shoes are way too big to fill. Directed by John Carpenter, Halloween is a sequel to the iconic 1978 horror film of the same name. The sequel continues to follow Michael Myers (James Jude Courtney), the ruthless serial killer who is now locked up and studied for psychological insights. 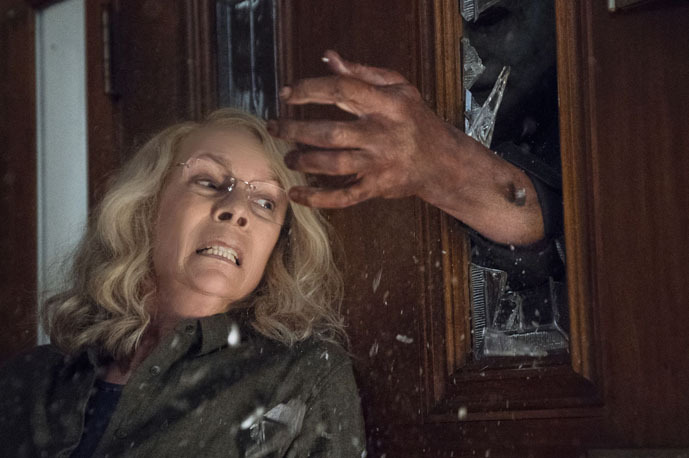 The sole survivor of his killing sprees, Laurie Strode (Jamie Lee Curtis), still lives in the past and has prepared for the moment when Myers returns. Refusing to play the victim, Strode fortifies herself with a gun and a house full of traps. However, Strode paid the price of estrangement with her daughter (Judy Greer), whose childhood has been scarred by her mother’s preparations. When Myers manages to escape on the day before Halloween, Strode has to prepare herself and her family for the final showdown between two archenemies. Fans of the 1978 film will flock to this film to see whether it measures up to the iconic prequel, which unfortunately is not the case. The film’s plot is somewhat all over the place with several sequences that are rushed and don’t make any sense, like the sequence with Strode’s granddaughter and her friends when she first sees Myers. Another sequence with Myers’ doctor is just plain implausible, proving that the film does not provide adequate character developments to justify the plot. The sequel’s main issue though, is the way Michael Myers is represented as a killer; the 1978 film portrayed Myers as a mysterious, devilish being who is part man part legend. This film, on the other hand, boils the myth down to just another serial killer who loves his mask, and, wanting to finish off his sole survivor, kills a couple of people along the way. The faceoff between Strode and Myers gives justice to Strode and is the film’s core. However, that only takes 20 minutes out of the 140-minute film, and most of what comes before it is messy and derogatory. For the acting, the way Myers was portrayed did not leave much for James Jude Courtney to do; with his face covered with a mask and shot only from behind, even body language was thrown out of the equation. Jamie Lee Curtis was absolutely brilliant in her role, showing different aspects of her character all at once, which is something that is very hard to do. Playing her daughter, Judy Greer did not really show the scarred or broken aspect of her character which was the main character trait, and that was a major let down. The sequel has some frights here and there, but it is not, and could never be, nearly as iconic as its predecessor. Halloween (1978), Friday the 13th (1980) and Scream (1996).